6664 shows up at NS. Thanks! I updated the roster also to reflect #6221 and #6232 at South. Didn't someone say more #6000 Orions were at west lower than #6041? So far I haven't seen anything to support that. I stated that #6039 is at West. As reported on another thread, 6635 is now at South. Still waiting to see where #6631, #6645, #6646, #6681 are now. Any idea what the assignment is now for the shuttle bugs buses of Lake/Cook Rd.? Are some former NS buses that serve that now run out of Highland Park? Someone said #2650 was running on an HP route? I'm still trying to track it down, but WebWatch reported 2630 and 2650 on HP routes the past two days. See this post in the Just an Observation thread. In addition to the HP buses listed there, 2636 showed up this morning. Also, someone else reported today that the buses were taken out of the fenced area at Lake Cook. Again, I haven't headed up there yet today, but that report seems consistent with the usual date that happens, plus WebWatch today indicating a mixture of 6200s and 6600s on those routes, as well as 2350 being on 213 when I physically saw it on 623 (a route normally stored at Lake Cook) yesterday afternoon. 6608 in Waukegan now. Saw it earlier today. According to the first page here, was from North Shore. Far as I'm concerned, we should have traded them: We'd take 6608, if they take back our general manager (Who comes from there). Sounds fair to me. 2453 burned, and 6173 had its front bashed in and was cannibalized. Both have been long documented here, and were on the last for sale list. It might have been at one time, but my recollection of WebWatch was that it was most recently at West. But now we will never know. But it is showing that they are headed your way. Updated the roster today, finally located #6645 at South, (still looking for #6646) transferred a few #6600's from West to North, removed the #2400's and put the #2300's on the apron at NS, (probably should just remove those) updated the axess' assignments. I still might need to transfer a few #6600's from West. Other than that it should be up to date. Anyone know if any ex-North Orion Is are at Highland Park awaiting Ravinia service? I've heard some things going around about it being possible. I know a couple North drivers who also drive Ravinia shuttles, I'll ask one of them when I see them next, though I see neither of them very often. According to the mailed schedule, have to wait to June to see anything on the street. 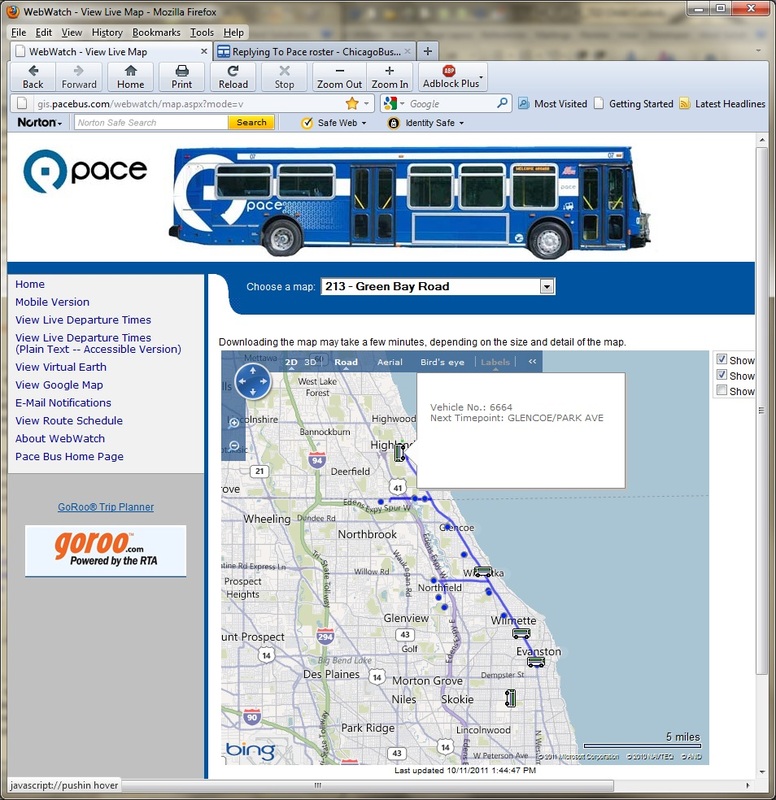 Interestingly, coming north on Waukegan Road with my dad, we had bus 2637 behind us through Lake Forest and Lake Bluff. A mechanic appeared to be driving it, run box had "6000" in it. Turned westbound on Rockland Road (Highway 176). Seems a bit out of place for a Highland Park bus. Although bizarre sightings like this are common, it sounds from your "mechanic driving it" that it was in for some sort of service, such as the midlife rehab or something else. Highland Park buses have regular run numbers (like "612" on Saturday) if they are in service. At first I thought it might be a change up for a Northwest division bus until I got home and checked the roster. You're probably right, probably heading somewhere for work to be done on it. Wouldn't affect Northwest, as Highland Park has always had its own allocation, and NW's EZ Riders are 2767-2792. Right, but would not have known that at the time in dad's car. We just thought it kind of interesting, as the bus was literally two blocks away from his house, and he knows North has no blue buses. Bus 2638 spotted at North Division. Northbound on Lewis Ave, headsign of "To Garage", turned east on 10th to the garage. Driver seemed surprised I hadn't seen this yet. I told her it is my birthday today (Which it is), apparently an El Dorado made for a birhtday surprise! Since not in service (at least according to the sign) something like your sighting of 2637? Or was it just going out of service? Maybe HP is giving up its two surplus buses to North, but that doesn't seem to have been pinned down yet. "To Garage" is not the same as "Not in Service". Plus, it was heading to the North garage, I got off the Lewis bus at 10th Street, and physically saw the bus turn in to the garage. Almost but not quite. The other possibility mentioned before is that the HP buses are getting their midlife of other major maintenance at the North garage. I'll also see if it registers on WebWatch this afternoon. I've seen buses leaving Hp Pub Works heading north on Hwy 41 before. Around here, the two signs are generally not used interchangably, though exceptions to exist, especially if manually setting the sign is required. Would seem odd if North did any rehab work, as North has never had these buses. WebWatch will be a good way to know. I'm heading out of town around lunchtime, will be in the North Woods with no internet access until I return Sunday evening. ...Would seem odd if North did any rehab work, as North has never had these buses. WebWatch will be a good way to know. The only reason I raise that possibility is that it seems even more unlikely that the Highland Park public works garage would do it. Given that a good amount of the buses scheduled for the midlifes are with contractors (i.e. about 35 in Naperville and 3 in McHenry, besides HP), it will be interesting to see how Pace handles this (in division garages or at the vendor's facility). I see it as a checkup before IDOT/testlane service. I'd see Pace North at Delf's Jeep test lane many times. North getting Eldo's is not a treat. Trust me. Yes, I know the El Dorados would not be much of a treat. If they are for here, then perhaps for the 573, as ridership on that route is fairly low, and a four cylinder El Dorado would be more cost effective than a 6 cylinder NABI. Of course, being that it looks newer may help curb appeal a little (Though not by much). Time will tell what it was doing here. I think Delf's is on Belvidere, and there's still the question of why it went in to the garage. What I meant is that it went to north for pre maint work before getting DOT certified. then north will run it to Delfs. I've seen the HP works and it has not a proper facility for dedicated bus work. I believe Pace would want their mechanics to give it a once over first. Plus getting Eldo's for 573 wold be not cost effective. A specific model for one route which is under performance does not make sense. I personally see sticking to one model instead of 3 or 4 keeps things simplified... less parts... less pain.